Young beautiful couple on a date talking, laughing and drinking coffee sitting in a cozy expensive restaurant. Young happy couple talking freely and drinking coffee on a date in a new expensive restaurant. 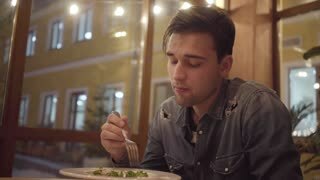 Portrait of a young thoughtful guy eating at a restaurant alone. A sad man is having dinner with an expensive cafe. 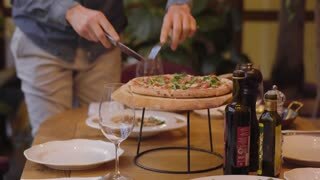 Unrecognized guy cuts delicious pizza lying on a table in a restaurant using a knife and fork. Exquisite food in an expensive, presentable restaurant. 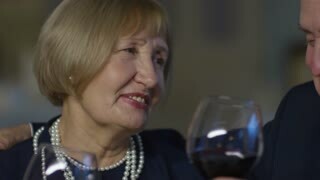 The experienced chef prepares a delicious dish in the kitchen of an expensive restaurant.